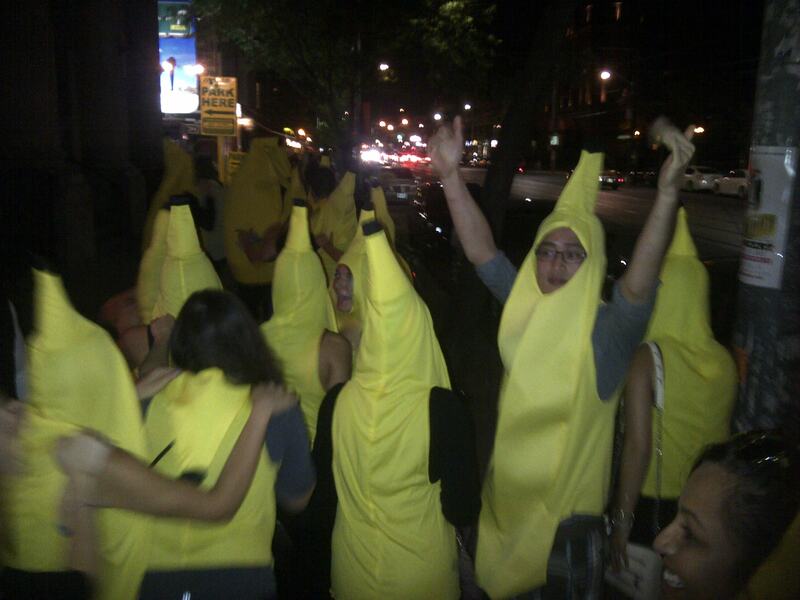 How many people can say that they participated in a conga line of bananas down College Street? This was one of the many highlights at my first Banana Bar Crawl. Cyanide & Happiness is a daily web comic published on explosm.net. The creators of the comic were in Toronto for FanExpo 2013 and they held this meet up for the second time. I must admit, I have never heard of the Cyanide & Happiness comic, but when I heard about the possibility of pub crawling with hundreds of people in banana suits, my friend and I said sign us up! – Don’t not be a banana. – It’s easy to find banana costumes locally or online (just Google it). – This is a for-fun event, so please don’t ask for free drinks because of your costume. We’re just regular bar patrons, except better looking. – Bring cash! You can move between bars faster that way. – If a given bar is at capacity, don’t worry. There’ll be enough of us to “split” up and still have a good time. Sound appealing? It should, it was so much fun. 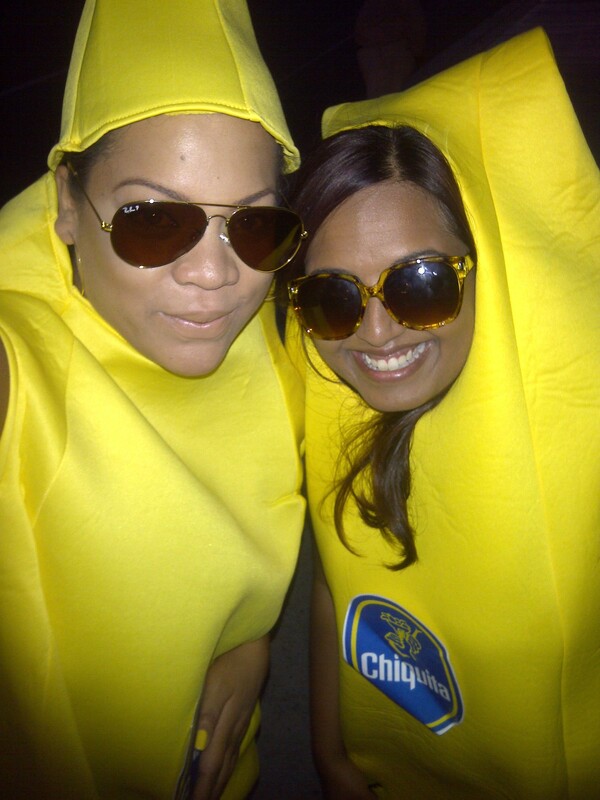 So my friend and I started the evening taking the ttc to the venue in our banana suits. This is going to sounds silly but honestly, people are so much nicer when you’re dressed in a banana suit. People stopped to say hi, wave and take pictures of us the entire way there. Travelling on the bus as a banana was actually one of the highlights. The Facebook event listing directed the group to meet at Andy Poolhall for 8pm. 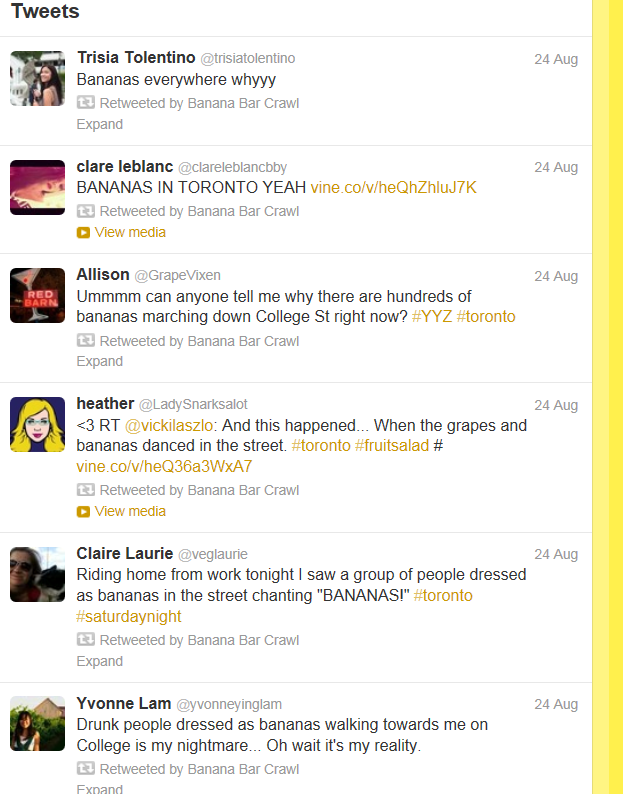 Then, you are instructed to follow @bananabarcrawl on Twitter for updates throughout the night about changing locations. We arrived at about 9pm just in time to see all of the bananas spilling out of Andy Poolhall. We were swept into a ginormous conga line, and the fun began! We made our way down College Street to a bar called Johnny Jackson’s. This was our favourite stop of the night because of the dance floor. 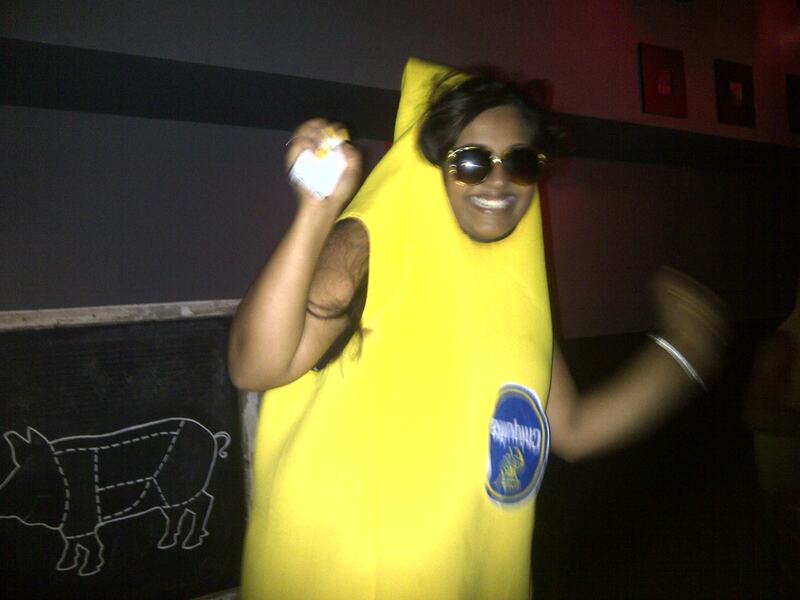 Let me just tell you, you haven’t lived until you party on a dance floor full of bananas. Shake it like a polaroid picture, bananas! 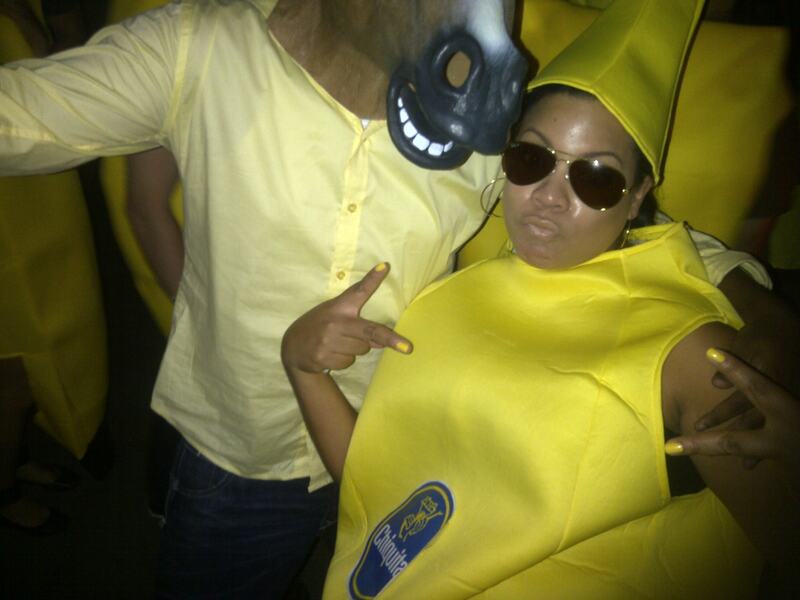 Horse+banana +duckface= FUN! After about an hour, the bananas moved on. This is where it started to get hairy and bananas started to split. We made our way to a bar called No One Writes to the Colonel. While this was a very cool looking space, we didn’t stay long. They were at capacity and could not accommodate many bananas. At this point, there were bananas at The Colonel, Sneaky Dee’s and Crown and Tiger. Twitter proclaimed that bananarchy was rampant. Hungry, we took a bit of a detour and stopped to grab a bite. When we were ready to rejoin the bunch, it was after one and the remaining bananas were at Free Times. 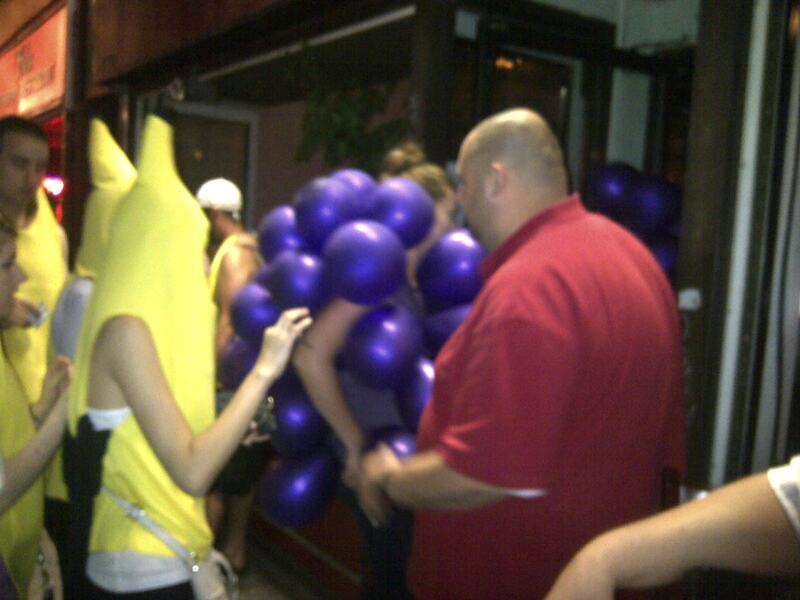 On our way to Free Times, we heard that there was a grape vs banana turf war on College. When the bananas told off the grapes, they were accused of being “grapecist”. We called it a night after free times and headed home. Committed to this banana thing, we kept costumes on all the way. More pictures. Funniest part was that a friend recognized us on Instagram the next morning in a pic we didn’t pose for. We knew people were trying to take sneak pics on the train! Guess that’s just the price you may when you travel dressed as giant fruit. 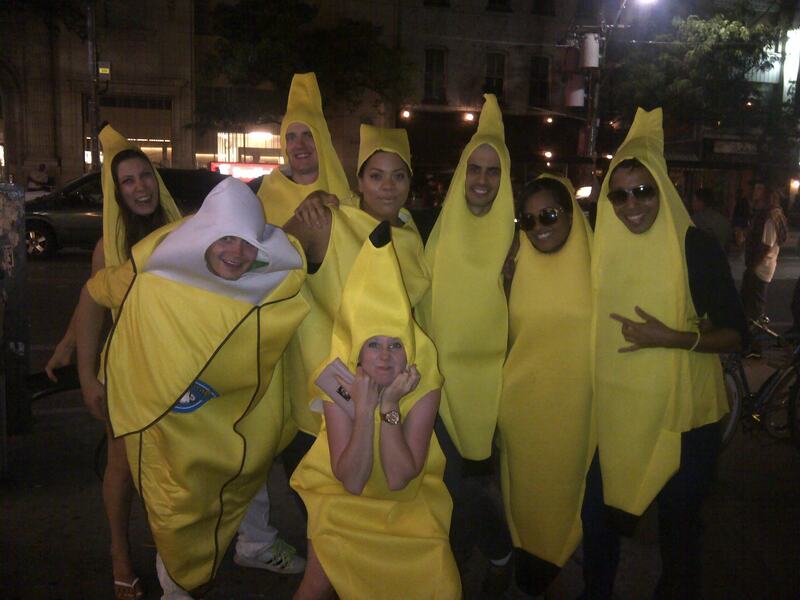 The banana bar crawl was so much fun. It was great to meet new people and bond over our collective silliness. Although our banana suits were ridiculous, by the end of the night we thought that the girls we saw in sky-high heels and barely there dresses were a whole lot more ridiculous. So see? There are valuable lessons to be learned from a banana bar crawl when you peel away the layers! That’s my last banana pun, I swear. Did you catch them all? At least they were fruitful. Good times! We will definitely be getting a group together and doing this again next year. WOWSERS! I thought that the idea of a Banana Pub Crawl was good but the post and, from the sounds of things, the actual experience was even better! It was so much fun.See you next year, Kath! You have 12 months to acquire a banana suit. So funny, what a small world! 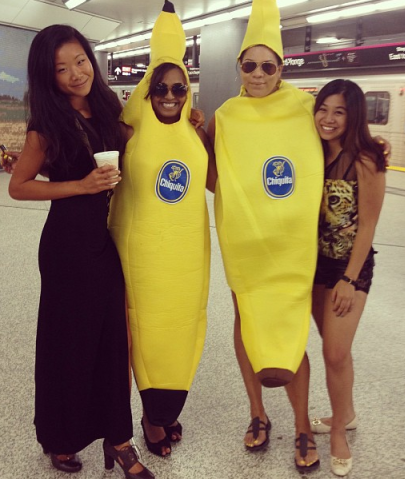 Oh dear…I just might have to get a banana suit and join you for some bananrchy next time! I give you guys such props I could never dress up like a banana and leave my house lol! Absolutely! We’ve got the suits now. You better believe we’re gonna use them! How fun does this sound? IF I drank anything exciting I would so be there and be a short little baby banana! I loved the puns good times! You and Suze are so brave! It looks like you had sooo much fun – I will try and be brave enough to come next year…and LOL to the grape/banana turf war – too funny! This post made my day. It was so much fun! You’ve got to come next year! !